Lights Beach is a gorgeous beached area located south-west of Denmark (south on Ocean Beach Road, turn right on Lights Road). 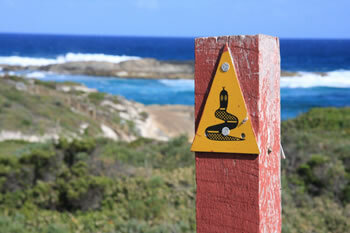 Not only is this an excellent day-trip location, but Lighst Beach is part of the Bibbulmun Track. View the Beaches Map of Denmark below to get your bearings. Lights Beach is actually three beaches accessible from one place. The eastern beach has a unique ocean-waterfall with waves crashing into Princess Pool and coursing down the waterfall onto the beach. Ideal for paddling. 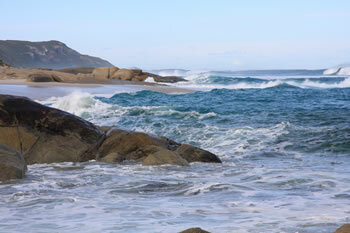 The Central Beach has large waves and is not suitable for swimming but gives a fantastic view of William Bay and the Southern Ocean. The Western Beach has an offshore island and connects to William Bay National Park. VIEW A MAP to Lights Beach! 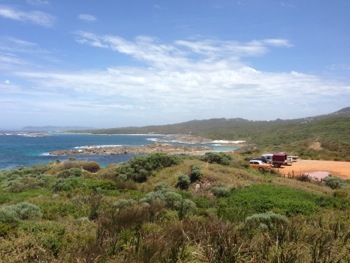 Lights Beach Lookout, just a few metres from the carpark is beautiful. A paved walkway heads east (left, facing ocean) along the ridge above the beach, around a headland, and down onto Lights Beach East with a rock pool and waterfall. The views from the lookout towards Wilson Head are incredible. Heading west (right, facing ocean) from the carpark towards William Bay National Park along a sealed track which is also part of the Munda Biddi way, a world class bike trail which winds along the south west coast. There are two beaches separated by an offshore island. Beautiful views toward William Bay and heathland. The main beach at Lights is viewable from the platform off the car park. This white, sandy beach is a perfect display of the south coast of Western Australia. The white sand, rounded granite rocks, green hills and wildflowers are a memorable experience. The Lights Beach lookout is an amazing place to watch the sun set over William Bay. It is accessible to anyone being so close to the car park. This beach has incredibly strong waves close to shore and a no-nonsense rip. We don't recommend swimming unless you are very familiar with the conditions. Lights Beach (east) is one of our personal favourite locations on the south coast. This beach has something for everyone and includes some amazing natural features. From the staircase there are spectacular views towards Wilson Head and the Denmark Community Windfarm turbines on the headland. At the base of the stairs there is an ocean waterfall which cascades from a pool which constantly refills from the large waves which crash and fill the pool. This is known as Princess Pool and is a beutiful wading pool at medium or low tide. Hiking gear required as this is a long-distance trail. The crashing waves fill Princess Pool which then cascades down a waterfall onto Lights Beach East. This rock is sometimes twenty metres tall when exposed by the waves of Lights Beach East. There are large rock formations connecting with this end of the beach with sea-loving wildflowers, crabs and other rock-loving creatures. See the Denmark and Surrounds Map to see where Lights Beach is located. 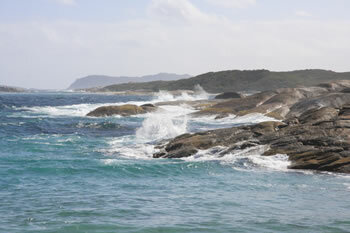 Lights Beach (west) connects to William Bay National Park and the Bibbulmun Track passes directly across the beach leading toward Tower Hill. All year round there is a small stream coming from the surrounding countryside and coursing across the beach. 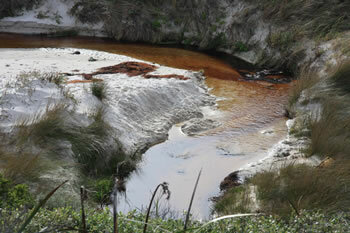 Its tea-coloured waters are due to the tea-tree leaves which stain the water a beautiful orange-red hue. 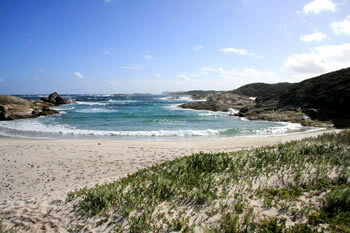 This is a popular destination as the beach offers great views of nearby William Bay. Elephant Rocks can even be seen in the distance on a clear day. At the far end of the path to the right of the carpark, a staircase will take you onto the sand and into William Bay National Park from the east. 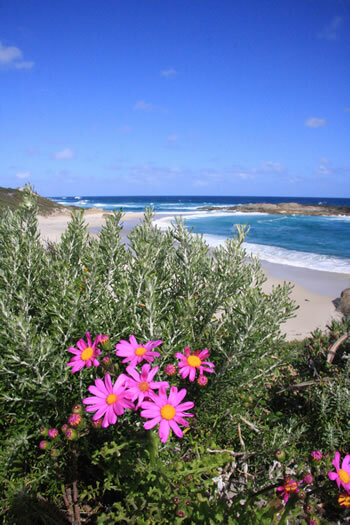 William Bay National Park covers almost two thousand hectares and has some of the most spectacular coastline including Greens Pool, Elephant Rocks, Elephant Cove, Tower Hill. Lights Beach is well worth a visit if you're on hoiday in Denmark, Western Australia. It is a rocky stretch of coastline showing clearly the power of the frequent large waves coming ashore. Always be careful when near the ocean. A good tip is to look at the highest water mark and stay well above there. Watch children at all times. Taking the Bibbulmun Track from Lights Beach West to the west leads past Waterfall Beach and Madfish Bay then across the hillsides to the Tower Hill station. 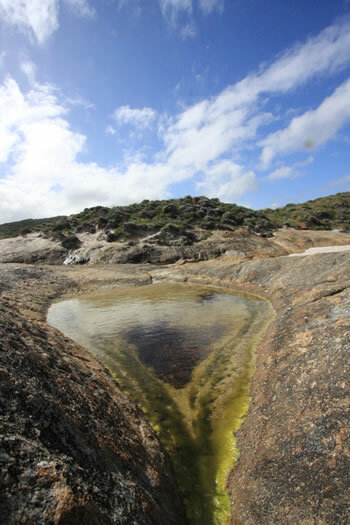 From Tower Hill you get views of Greens Pool and Elephant Rocks below. Stay close to Lights Beach! 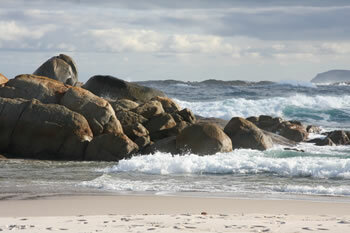 There are many beautiful beaches in Denmark, Western Australia. Ocean Beach is the closest to town and the most popular Surfing Beach in Denmark. 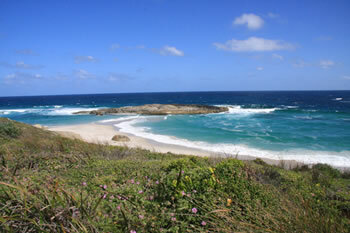 Greens Pool and Elephant Cove are two of the most beautiful beaches on the south coast. Tap the markers for information about the locations on the Map below.